Hello everyone, I hope you are enjoying the nice weather lately. Hopefully the groundhog, Buckeye Chuck, was correct when he predicted six more weeks of winter this year. Around this time of year, we are all dying for a spring break in the tropics or maybe a week in Wisconsin where the temperature stays in the 50s. Unfortunately, I am staying in Wisconsin this spring break and I hope you all are doing something more exciting than me but please, refrain from rubbing your beautiful pictures on the beach in my face- I beg of you. Something that also happened earlier this month that hoped to bring in some warm weather- in terms of warm profits was Uber’s launch of their new app design and logo. According to their website this revitalizing of their brand was much need and while Uber’s CEO and design team completely standby their new design-others aren’t so sure. “Uber’s new logo is a strategic misstep that in the long run could weaken its brand,” said Fortune. Believe me he is not the only one who feels this way. People soon began to post on social media and write articles on many of the negatives behind the new logo. What Uber’s new logo reminds us to do is ask ourselves: What are you trying to communicate to your customers? Your logo is the first impression to your consumers as they explore your values, products, and your company as a whole. Uber began in San Francisco, California and have now spread to over 400 cities in 68 countries around the world. Their company surrounds themselves around this idea of trustworthiness, as customers know to always rely on Uber to transport them around their local cities. Their old signature “U” let customers know that they were going to get the “Uber” experience whether they were requesting a driver in their hometown or a city they were completely unaware of. With this new app, their look and feel has completely changed. 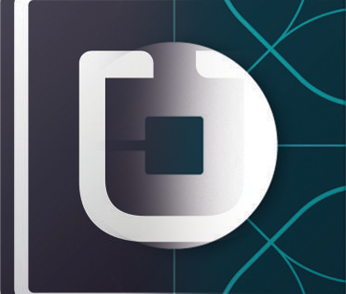 As I go through my phone their logo is completely unrecognizable and I would have to know that Uber changed their logo to click on their app. In my opinion their new app has a “gamey” feel and their logo looks like the Pac-Man character from our favorite childhood game. I understand they were attempting to go more down the technology route and modernize their brand image, however, you don’t want to change your image so much that your customers can’t recognize your image. Also important to remember is that Uber is a worldwide brand that must appeal to various cultures and languages, which can now be lost through their unrecognizable image. In 2010 Gap decided to change the look of their logo and within a month they were forced to revert back to their old logo due to their backlash from customers. While Uber seems to be sticking by their new logo besides the immense amount of critics, both companies seem to have made similar mistakes. Both Uber and Gap focused on trying to be to design-focused and lost sight of their brand message when creating their new logo. Maybe Uber will realize the design changes they made and will revert back to the original like Gap. To prevent all of the above from happening it’s important to start with the proper design team who can recognize your goals and execute them. While Uber chose to use their in-house design team, they relied on people within their company who maybe were too focused on the new design instead of the branding that it would create. You must also look at your audience and know who you are targeting and for Uber its’s anybody who needs a ride anywhere. This means be the model who needs a driver from the airport to her photoshoot or an older person who is now unable to drive anymore. With this new logo Uber may seem unapproachable to those older consumers who are surprised by the modern look and feel. While their new app looks super high-tech and cutting edge, they failed to communicate to loyal customers and future customers what they do. A company must keep their brand in mind or they will fail to convey their messages to their customers. Your logo is so much more than a first impression you need your customers to continue to return.